in the Grade III, $100,000 Tokyo City Cup at a mile and a half on the main track. Trained by Phil D’Amato for Michael House, Big John B has won at distances from one mile to a mile and a half, on dirt and turf, and has 15 wins from 41 career starts. The eight-year-old Hard Spun gelding bred in Florida by Brylynn Farm, Inc., won last year’s Tokyo City Cup by 2 ¼ lengths, coming from seventh and last as is his wont. He has earned $851,030. Big John B has been claimed six times in his career, most recently by D’Amato for $50,000 from Michael Stidham at Keeneland in April of 2014. Rafael Bejarano, who has ridden Big John B in nine of his last 10 races, the last three in a row, retains the mount in the Tokyo City Cup. Also scheduled for the Tokyo City Cup is Hi Happy, fourth behind victorious Shaman Ghost in the Santa Anita Handicap last out on March 11. Tiago Pereira rides the five-year-old Argentine bred full horse for trainer Felipe Souza. Veteran jockey Stewart Elliott, who was named winner of the 2017 George Woolf Memorial Jockey Award on Feb. 24, will receive the prestigious trophy, which depicts the legendary George (The Iceman) Woolf, in a Winner’s Circle ceremony between races five and six at Santa Anita on Sunday. Established to honor the memory of Woolf, who died following a spill on Santa Anita’s Club House turn on Jan. 3, 1946, the Woolf Award was first presented by Santa Anita in 1950 and this year marks the 68th anniversary of the honor that can only be won once. 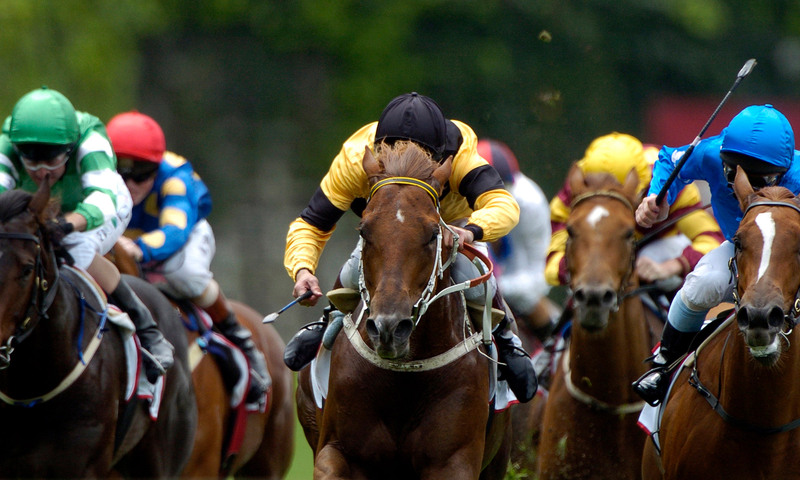 Voted on by jockeys nationwide, the Woolf Award seeks to recognize riders who have not only achieved a high degree of success in the saddle, but who have conducted both their personal and professional lives in a manner that brings credit to the sport of Thoroughbred racing and to them personally. Born in Toronto on March 11, 1965, Elliot celebrated his 52nd birthday on Santa Anita Handicap Day, March 11. A strong finisher who is also an outstanding judge of pace, Elliott, best known for capturing the 2004 Kentucky Derby and Preakness Stakes with Smarty Jones, has now amassed more than 4,700 career wins. Anyone who witnessed the rail-skimming victory by Gary Stevens aboard European invader September Stars at 5-1 for trainer Paddy Gallagher in Thursday’s seventh race at a mile and an eighth on turf might have thought the Hall of Fame rider was 23, not 53. Back in action on March 9 following hip replacement surgery Dec. 21, Stevens is riding with the vim and vigor of a teenager, displaying the grit, determination and intense competitive spirit that’s ingrained in his DNA. “Gary’s feeling great since he’s come back and he’s showing it on the track,” said his agent, Mike Ciani, who also represents apprentice Ruben Fuentes. “Gary’s planning on staying in Southern California and rebuilding our business, riding for all comers. Stevens has three wins since his return (one at Oaklawn Park for Jack Van Berg), and rides 5-2 morning line favorite Ashleyluvssugar for Peter Eurton in today’s Grade II, $200,000 San Luis Rey Stakes at a mile and a half on turf. Stevens ranks fourth all-time in stakes wins at The Great Race Place with 208, behind fellow legends Bill Shoemaker (260), Laffit Pincay Jr. (253) and Chris McCarron (242). FINISH LINES: Mark Glatt had no race in mind Saturday for Law Abidin Citizen, who won his turf debut Friday by a head on Santa Anita’s unique downhill course at about 6 ½ furlongs. “We’ll see how he comes back and go from there,” the trainer said. 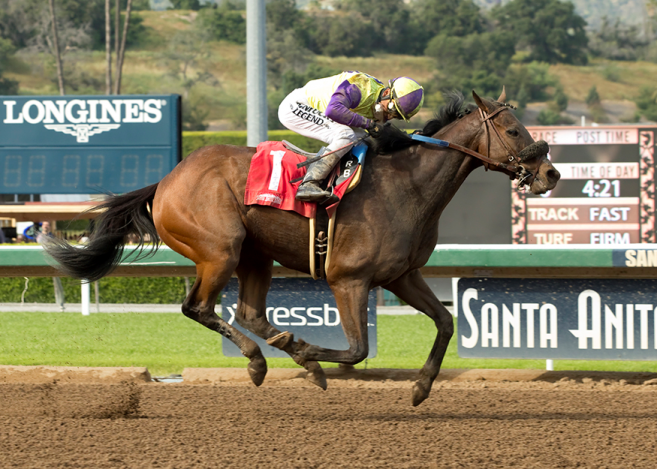 A three-year-old son of Twirling Candy, Law Abidin Citizen was second in the Grade II San Vicente Stakes at seven furlongs on dirt behind Santa Anita Derby-bound Iliad before his grass victory . . .
On Saturday, April 8, Santa Anita Derby Day, The Great Race Place will offer guaranteed pools of $1 million on the Late pick 4 and $100,000 on the Pick 6 . . .
Nap Lajoie, a three-year-old gelding bred in California by owner Nick Alexander, who names his horses after Major League baseball stars, makes his debut in today’s sixth race at Golden Gate Fields. Nicknamed “The Frenchman,” Napoleon “Nap” Lajoie played from 1896 to 1916, for the Philadelphia Phillies and the Philadelphia Athletics, compiling a lifetime batting average of .339, but that made no impression on often skeptical Steve Miyadi, who trains the horse. “He’d probably hit .110 if he was playing today,” Miyadi said.